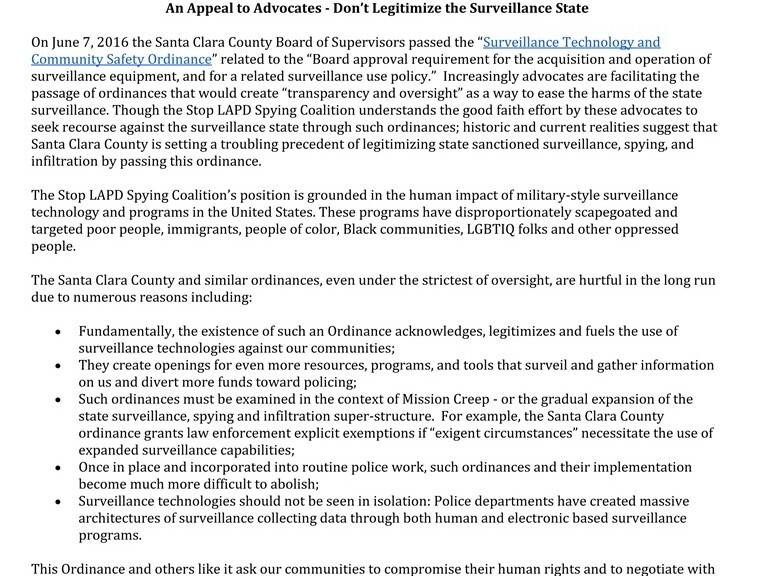 On June 7, 2016 the Santa Clara County Board of Supervisors passed the “Surveillance Technology and Community Safety Ordinance” related to the “Board approval requirement for the acquisition and operation of surveillance equipment, and for a related surveillance use policy.” Increasingly advocates are facilitating the passage of ordinances that would create “transparency and oversight” as a way to ease the harms of the state surveillance. Though the Stop LAPD Spying Coalition understands the good faith effort by these advocates to seek recourse against the surveillance state through such ordinances; historic and current realities suggest that Santa Clara County is setting a troubling precedent of legitimizing state sanctioned surveillance, spying, and infiltration by passing this ordinance. The Stop LAPD Spying Coalition’s position is grounded in the human impact of military-style surveillance technology and programs in the United States. These programs have disproportionately scapegoated and targeted poor people, immigrants, people of color, Black communities, LGBTIQ folks and other oppressed people. Surveillance technologies should not be seen in isolation: Police departments have created massive architectures of surveillance collecting data through both human and electronic based surveillance programs. This Ordinance and others like it ask our communities to compromise their human rights and to negotiate with the Police State and the “Oversight Bodies” that rubber stamp police practices under the false pretense of privacy and civil liberty protections. Claims to privacy and civil liberties remain elusive for Black and Brown communities especially in a period of increasing evidence of racial profiling resulting from the use of intelligence technologies and programs. In January 2015 the LAPD’s Inspector General audit of the Suspicious Activity Reporting (SAR) program, a counter-terrorism program, revealed an overwhelming adverse impact on Los Angeles’ Black community. Similarly, close examination of predictive policing, another counter-insurgency tool, is increasingly becoming apparent as proxy for racial profiling with devastating impact on Black and poor communities. Immediately cease all funding for state surveillance programs and divert those resources to invest in the health and well being of our communities. We urgently need more investments in public housing, education, health centers, youth development programs, healthy food, and steady employment – factors that promote real public safety. The Stop LAPD Spying Coalition joins communities across the United States in organizing against racist police brutality and systems of oppression that foster state violence, and the continuing marginalization and murders of Black and Brown people. Reforms will not radically change institutions, such as jails or police departments, whose flaws are built-in by design; these institutions are rooted in the use of violence to preserve a social order based upon exploitation and conquest. Change and transformation can only happen through sustained grassroots efforts to dismantle and abolish systems of oppression. Reforms such as the Santa Clara Ordinance reverse the work of grassroots organizing and only serve to bolster the police state.